Brian Terrill's Small-Screen 66 - #51: "Pokémon"
In my Film Favorites countdown, I briefly considered the question of what constituted the best “video game movie” of all time. But when it comes to TV series, there is no debate. With more than 850 episodes over 18 seasons (and counting), Pokémon is one of the longest-running animated series in history. What’s more, although several series have been on the air longer, Pokémon surpasses them all in terms of episode count. For comparison, previous Countdown selection Arthur, which premiered one year prior to Pokémon, currently clocks in at 211 episodes…making the later series more than FOUR TIMES as prolific. However, Pokémon rarely appears in the “longest-running” rankings, presumably because it is considered to be broken into several separate series, each roughly corresponding to the different “generations” of Pokémon video games as they are released. So far, these have included simply “Pokémon” (the “original series,” if you will, corresponding to the Red/Blue and Gold/Silver games); Advanced Generation (Ruby/Sapphire); Diamond & Pearl (Diamond/Pearl…duh); Best Wishes! (Black/White); and XY (X/Y…ok, maybe the titles aren’t that creative). When the hat’s backward, you know he means business. For the uninitiated – if there are any uninitiated, anywhere – Pokémon (a portmanteau of “Pocket Monsters”) are creatures which possess formidable abilities, often of an elemental nature. Pokémon are primarily animal in appearance, though plants, humanoids, and other assorted oddities sneak in even in the first generation. Pokémon trainers acquire Pokémon by weakening them and then capturing them in “Pokéballs,” iconic red-and-white containers which convert a Pokémon into energy (by means never explained) for easier storage. After building up a team, trainers pit their Pokémon against those of other trainers in battle. Trainers instruct their Pokémon to employ various attacks by shouting commands from the sidelines. Victory is declared when all of an opponent’s Pokémon are rendered unconscious or refuse to fight. Yes, this is a show in which children order cute critters to batter one another into unconsciousness. It’s dogfighting, if the dogs had superpowers. And we couldn’t get enough. While I don’t want to veer too wildly from the show itself, understanding its appeal requires a knowledge of the broader, many-faceted juggernaut that was Pokémon circa 1998. While the franchise had been growing more incrementally in its home country of Japan (where the original “Red & Green” games debuted in 1996), in late ‘98 it crossed the Pacific full-fledged, sprawling across each and every media outlet which could conceivably sap the allowances of impressionable American pre-teens. The stateside release of the video games (now “Red & Blue”) in September corresponded almost exactly with the American premiere of the show, and the popular Trading Card Game would be out by December. I was beginning 3rd grade at the time, and it’s difficult to overstate just how thoroughly Pokémon saturated youth culture of the day. It was truly a superfad, to the point that many schools banned the distracting cards and other Pokétrappings on their grounds. In fact, I doubt whether any single media property has been so universally embraced by children since…though Minecraft admittedly comes close. It’s against this backdrop that today’s selection must be considered. Even in its television incarnation, Pokémon was ubiquitous. Throughout September and October of 1998, new episodes premiered EVERY SINGLE WEEKDAY, a pace facilitated by the backlog of episodes already produced in Japan (where the show had been airing for more than a year). And because the series is presented serially, kids had to tune in each and every day, or risk missing key plot developments. And there you have it: A show that reminds you you “can’t miss a day,” based on a franchise where you “gotta catch ‘em all!” Pokémon was consumerism in its purest, most concentrated form. The show even featured structural innovations calculated to further drive home the message of acquisition and devotion to the franchise. In the “Who’s That Pokémon?” bumpers which bookended mid-episode commercial breaks, viewers were presented with a silhouette, and asked to guess which of the series’ 151 Pokémon “species” it concealed. And just in case you still didn’t know Pokémon backwards and forwards after the episode proper AND the bumpers, the show always ended with the “Pokérap,” simultaneously the most mindless and ingenious aspect of the American version. These semi-musical 45-second bursts consisted of a “rapper” rhythmically chanting the names of 30 Pokémon, with an image of each Pokémon popping up to accompany its name. A backup singer provides encouragement to the rapper, and reminds viewers that they’ll need to tune in daily to hear the entire thing (150 over the five days from Monday-Friday). Okay…so the anime served as a precisely-crafted cog within the perfect brain-washing machine that was Pokémon. But was it a “good show?” Let’s take a look. Broadly speaking, the show follows the plot of the Pokémon video games. 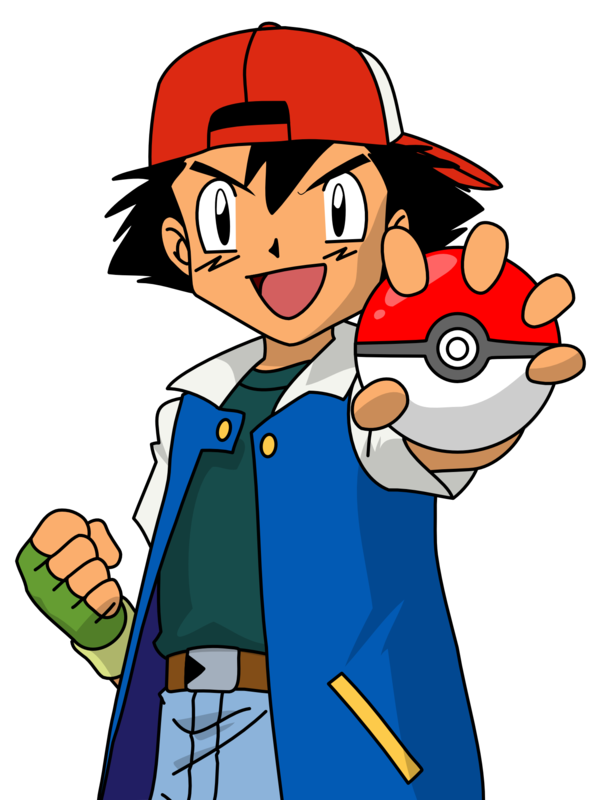 Ash Ketchum, a stylized adaptation of “Red,” the original games’ protagonist and player character, begins the series having just turned 10. In this world, 10-year olds are legally able to become Pokémon trainers, and can travel the world capturing the critters. 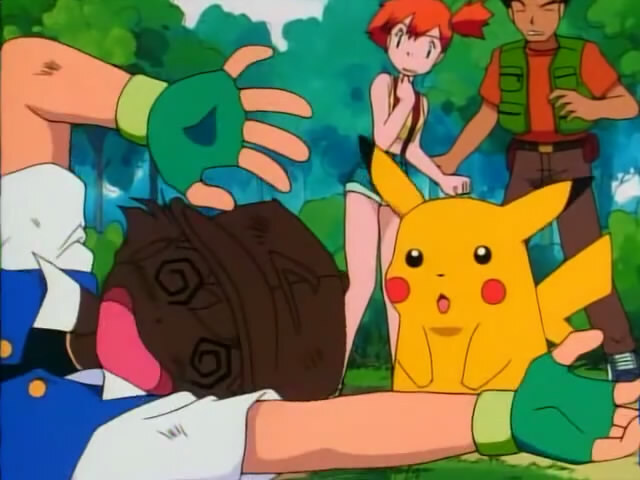 The night before Ash is to receive his first Pokémon from the local expert, Professor Oak, he inadvertently breaks his alarm clock (it being Pokéball shaped, he hurls it against a wall during an overexcited dream) and manages to oversleep.He rushes to Oak’s lab, where he finds to his dismay that all the available Pokémon (Gen I starters Bulbasaur, Charmander, and Squirtle) have already been distributed. The despondent Ash pleads with Professor Oak, who eventually concedes that he does have one Pokémon left…albeit a potentially defective one. 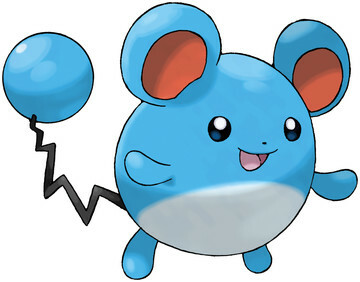 The Prof gives Ash a Pikachu, the iconic “electric mouse” Pokémon which would henceforth serve as the franchise’s mascot, and sends him on his way. Pikachu initially mistrusts and disobeys Ash. But when they inadvertently provoke a flock of Spearow (an aggressive bird Pokémon), Ash doggedly protects the injured Pikachu. He rushes Pikachu in the direction of the nearest city, expediting the process by “borrowing” a girl’s bicycle along the way in a very Marty McFly move. Impressed by Ash’s devotion, Pikachu fends off the angry birds with a mighty electrical attack. However, the lightning burst also obliterates the bike. The final moments of the pilot see Ash headed on foot toward Viridian City, the first stop on his Poké-journey. The rain which had been falling tapers off, and a huge, unidentifiable Pokémon soars over the newly-formed rainbow, signifying the boundless adventures ahead. All in all, it’s a pretty good episode, which succeeds in the key goal behind all pilots: getting us pumped to watch more episodes. Ash and Pikachu are soon joined in their travels by human companions. When they arrive in Viridian they are met by Misty, the owner of that ill-fated bike, who vows that she will follow Ash until he repays her. In spite of their bickering, Ash manages to slowly acquire a growing retinue of Pokémon, and by episode 5 faces off against his first “Gym Leader.” Gym Leaders are adept trainers who bestow badges upon challengers who best them. Once a trainer accumulates 8 badges from different cities, he or she is certified to compete in the Pokémon League, a highly popular and prestigious regional tournament. Ash’s first Gym Leader battle pits him against Brock, the Pewter City leader, who specializes in rock-type Pokémon. Though soundly thrashed in their first encounter, Ash returns for a rematch and beats Brock in something of a technicality when Pikachu’s electric discharge triggers the gym’s sprinkler system, weakening Brock’s Pokémon (in the series’ rock/paper/scissors-style gameplay, rock type is weak to water). Though Ash hesitates to take his half-earned badge, Brock insists, and when Brock’s deadbeat dad returns out of the blue to resume his old post as Gym Leader, the young trainer opts to join Ash and Misty on their adventure. But what are protagonists without a few good antagonists? For all is not well in Poké-dom. As in the Red and Blue games, the criminal organization known as Team Rocket has established a presence in the region, plotting to steal and exploit Pokémon for their own sinister ends. 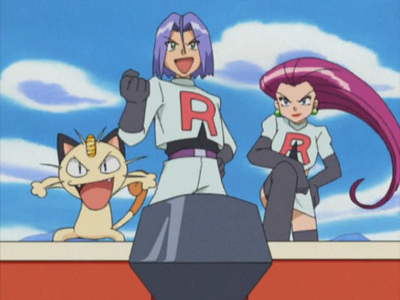 In the anime, Team Rocket is most often embodied by a trio of very persistent field agents: two humans named Jessie and James and a feline Pokémon, Meowth, who possesses the ability (rare among Pokémon) to speak human language. 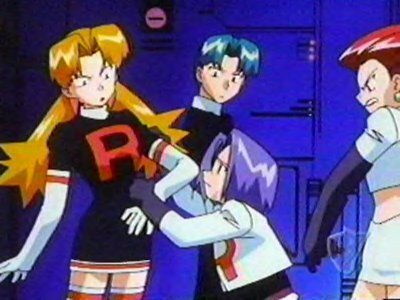 Jessie, James, and Meowth, herein referred to interchangeably as “Team Rocket,” first appear in Episode 2, in which they try to steal the patients at the Veridian City Pokémon Center (the in-game hospital for “fainted” Pokémon). Pikachu eventually foils their heist with a powerful attack that blasts them skyward, prompting them to scream that “Team Rocket’s blasting off,” a forced pun which didn’t merit the endless repetition it would receive. The end of the episode shows the villainous trio formulating a new plan: Clearly, this extra-powerful Pikachu must be “special,” and thus especially worthy of being stolen. This is the closest we get to an explanation for why the same three Team Rocket agents show up everywhere Ash goes, in virtually every single episode. 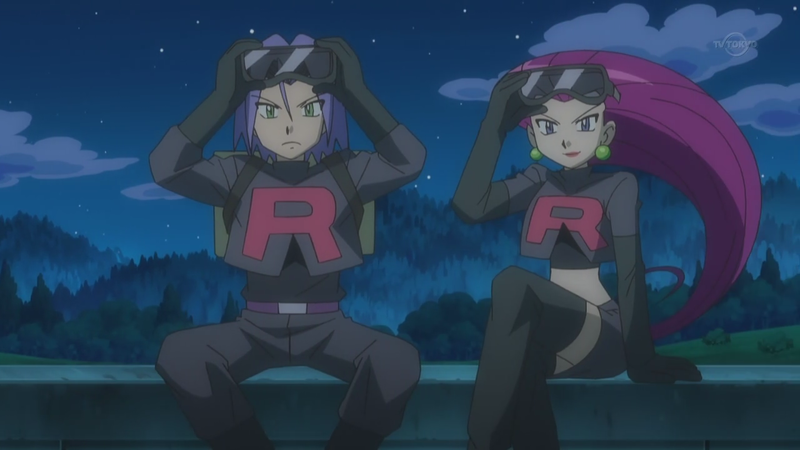 Team Rocket, In one of their cooler-looking moments. Even when I was a child, Team Rocket’s repetitive antics wore thin for me in short order. They’re by far the most (though by no means the only) formulaic element in an otherwise fairly expansive, diverse series, and it feels confining. Team Rocket “arcs” nearly always follow the same pattern: First, they appear in whichever new area Ash and co. happen to have just reached. They are typically wearing outlandish, none-too-convincing disguises, which nevertheless always seem to fool our naive protagonists. They then make several attempts to kidnap the kids’ Pokémon, relying on increasingly intricate contraptions (Pokémon-shaped hot air balloons, tanks, submersibles, etc.) as the episode progresses. At some point, they directly engage Ash and friends in battle. Each time they reveal themselves, they recite an introductory poem, declaring their desire “to denounce the evils of truth and love, to extend our reach to the stars above.” Inevitably, however, they are defeated, and someone or something launches them cartoonishly into the sky. As “Team Rocket blasts off again,” they shrink into the distance before finally disappearing in a pinprick of light. By the end of the extended “season” which he diligently followed, young Brian was thoroughly weary of Team Rocket’s tired gags. But I have to say that I’ve had a serious change of heart in recent years. Particularly in my latest re-watch (I told you it takes a long time “preparing” for these posts), I realized, unironically, that Jessie, James, and Meowth are the series’ most compelling characters. And it’s BECAUSE they’re such a joke that they’re so pitifully loveable. Adult villains failing to impede the progress of child protagonists is nothing new (see “Avatar,” “Harry Potter,” etc. ), but rarely do you feel so sympathetic with said villains. Perhaps Team Rocket’s charm lies in the fact that Jessie, James, and Meowth are in truth only low-level employees, “grunts” in the parlance of the video games. They toil in the name of “The Boss,” a shadowy crimelord who we eventually learn is Giovanni, the games’ final Gym Leader. The agents, and Meowth especially, habitually fantasize about how much their station in life will improve when they finally pull off a legendary heist and win the boss’s favor… something which, of course, never actually happens. Instead, “the trio” is doomed to week after week of mediocrity and even poverty (hey, extensive wardrobes and custom submarines don’t come cheap), and you can’t help but feel for them. And though they’re the only agents we usually see, leading us to assume that they must be reasonably prominent within the organization, Giovanni’s obvious disdain for them makes clear that this is not the case. 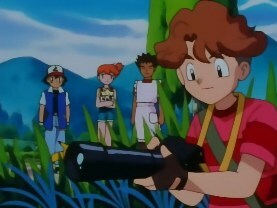 Later in the season, Ash, Misty, and Brock encounter ANOTHER duo of Team Rocket operatives, Butch and Cassidy (Ep. 57, at which point I finally got the “outlaw” puns). Butch and Cassidy wear the standard black uniforms from the video games…suggesting that Jessie and James’ WHITE uniforms are non-regulation, and further strengthening the impression that their prominence is self-declared and, ultimately, imaginary. That’s some Grade A stank-eye, Cassidy. The show’s creators seemed to recognize the sympathetic nature of the Rocket trio, and several episodes expand upon their pasts. Jessie, we discover, was abandoned by her parents at a young age, and was so poor that she would eat snow to survive. James comes from a much wealthier background, but pulled a Titanic when he ran away to avoid an arranged marriage and the strictures of upper-class life. Even Meowth reveals that he learned to speak and walk on his hind legs in hopes of impressing a sophisticated female Meowth, who ultimately rejected him due to his “freakish” affectations. As “rocket” was the first word he ever read in a picture book, he was drawn to the Team, and soon the three partners really were thick as thieves. But enough about my epiphany-driven Team Rocket lovefest. How does the rest of the show hold up? Reasonably well, in most regards. The series did a great job of utilizing its source material, and episodes depicting key events from the games’ plot (gym leader battles, for instance), alternate with ones focused on a specific Pokémon species. For example, in one episode, burrowing Diglett are causing trouble at a construction site. In another, the Tarzan-inspired storyline sees Ash and friends encountering a feral boy raised by Kangaskhan. And in a slightly irrational favorite of mine (Ep. 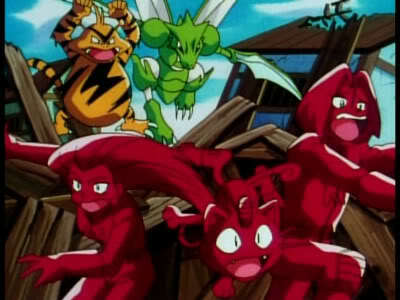 42, “Showdown at Dark City”), the kids stumble into the midst of a gang war between a gang obsessed with Electabuzz and another which favors Scyther. For some inscrutable reason, a large amount of ketchup is involved. Throughout, the show captures a wide variety of emotions. While moderate to severe hokeyness prevents me from feeling quite the same emotional connection to the series as I did as a kid, plenty of episodes still pack an evocative punch. 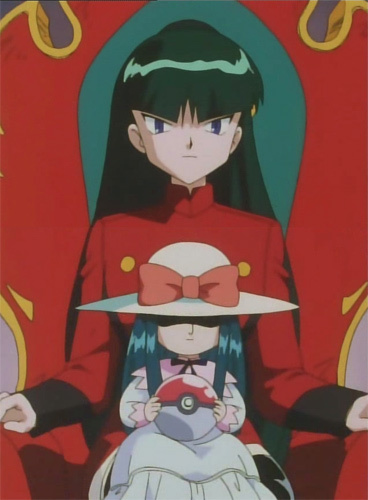 The arc in which the protagonists face Sabrina, the psychic-type gym leader, are still reliably creepy. I mean, she turned her parents into voodoo dolls. She trapped Ash in a model town a la that one Twilight Zone episode. And she communicates split-personality-style through a ventriloquist dummy shaped like a little girl. And if you didn’t feel something when Ash releases his Butterfree, the first Pokémon he ever caught and fully evolved, into the wild (and the theme music played, both verses, IN THE SHOW ITSELF), you’re some kind of monster. I also feel the need to mention Episode 14, “Electric Shock Showdown,” in which Ash battles the electric-type Gym Leader, Lt. Surge. Surge’s strongest Pokémon is a Raichu, the evolved form of Pikachu, and Ash wrestles with the question of whether to evolve his own Pikachu in hopes of being able to compete. For some reason, this was by far the most emotionally engaging episode for me as a child. And I’m not alone: YouTube user Sam Hart was moved enough to write an entire musical number based on the episode. Not only would the anime incorporate elements from the earlier games…It would also occasionally offer glimpses of games to come. Long before 4th graders were embroiled in playground arguments over the legitimacy of leaked “Pikablu” images, Episode 46 of the anime introduced a mysterious egg which would turn out to be the Generation II Pokémon Togepi. The episode originally aired in May 1998, and yet “Gen II” games Pokémon Gold & Silver would not be released in Japan until November 1999, a full 18 months later. That’s pretty impressive… but pales in comparison when you think back to the pilot episode. 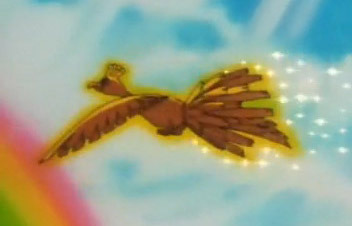 Remember that mysterious flying Pokémon at episode’s end? That was totally Ho-oh, a Gen II legendary Pokémon and the mascot of Pokémon Gold. Another character introduced in this fashion was Todd Snap, a Pokémon photographer who would shortly star in the series spinoff title Pokémon Snap on the Nintendo 64. All of this is not to say that the show is perfect. After all, we still haven’t cracked the Top 50 on this Countdown. Aside from the formulaic elements already mentioned, the series has some other issues, many of which stem from decisions made regarding localization of the American version. For instance, English text and images are often superimposed over blocks of Japanese text, and these sloppily overlaid titles have a tendency to jitter around noticeably between frames. There are some obvious translation disparities, too: In the English dub, characters often refer to American foods such as pizza, which wouldn’t be so odd, except for the fact that they do it even while eating clearly Asian foods. One example is the rice cakes Brock frequently prepares – the dub refers to them as “donuts” in early episodes, despite them looking nothing like donuts. Eight-year old me was very confused. Differences in cultural mores even caused 4Kids Entertainment, the studio responsible for the localization, to exclude several episodes from the American lineup. These now-legendary “banned episodes” include gems like “Beauty and the Beach,” in which characters enter a beauty pageant (James, incognito, dons an overlarge pair of false breasts), and “The Legend of Dratini,” which takes place in the Safari Zone and was banned due to one ranger’s habit of frequently brandishing firearms. But by far the most well-known banned episode was #38, “Electric Soldier Porygon.” Several sequences feature intense, rapidly flashing colors which fill nearly the entire screen. These sequences allegedly triggered epileptic seizures in nearly 700 Japanese viewers, most of them children, and the episode instantly became a legend of television history, both feared and mocked. The extent to which the incident, dubbed the “Pokémon Shock,” was due to actual photo-sensitive epilepsy or simply mass hysteria has been debated in recent years, but the episode has never been re-aired on television either in Japan or abroad. Click to view animated version at your own risk. After 80 episodes, we’ve seen Ash travel the length and breadth of the land, defeat 8 elite gym leaders, and encounter nearly every Pokémon under the sun. He finally achieves his dream of becoming a Pokémon master and competing in the Pokémon League championships…and he DOESN’T WIN. Even the rival who defeats him doesn’t win. After all this build-up about doing your best, believing in yourself, relying on your friends, and realizing your destiny, all we get is a lousy TOP 16 FINISH. So you “wanna be the very best,” huh? Too bad you COULDN”T EVEN MAKE THE QUARTER-FINALS! This realization was made even more shocking when I read up on some of the later seasons, and discovered that Ash’s ignominious defeat in the Pokémon League wasn’t a one-time thing. In fact, it’s happened EVERY. SINGLE. SEASON. The closest he’s come to winning a single League tournament was in the “Diamond & Pearl” series…in which he finished Top 4. The only reason I can think of for Ash never winning is to provide an explanation as to why, despite his competing in virtually every tournament and beating every gym leader in every region IN THE WORLD, and seemingly meeting legendary Pokémon every other week, NO ONE RECOGNIZES HIM. Or the fact that he never seems to age. But that’s a different kettle of fish entirely. At least my research on later seasons turned up ONE promising piece of information: In the Best Wishes! series following the plot of the Pokémon Black & White games, Jessie, James and Meowth finally get a promotion, a modicum of respect from their boss, and a moderately heightened level of competence. And yes, they even get those snazzy black uniforms. Oh, hey, that reminds me. Before I let you go, allow me to blow your mind. In the American dub, Misty was voiced by Rachael Lillis, who also provided the voice of Jessie. Brock was played by Eric Stuart…who also voiced James. I feel like there’s some deep, symbolic significance in Ash being constantly followed by his dearest friends and worst enemies, and having them be the same people. Or maybe they just didn’t want to shell out money for more actors. Whatever the case, the show endured, even if my devotion hasn’t. Ash journeyed to the regions explored in later game generations, casting aside his old friends for new ones at every turn and meeting enough species of Pokémon to make Bill the Researcher (that guy at the lighthouse who speculates that there are “150, or EVEN MORE” varieties) sound like an idiot. In the end, maybe it’s good I only watched the initial run. 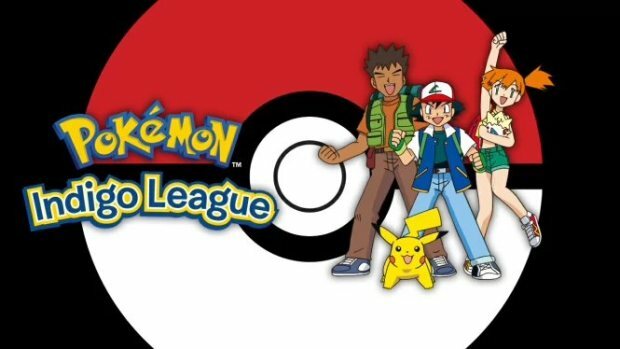 If you too “wanna see the very best,” then head on over to Netflix, where all of Indigo League is currently streaming. -While 4Kids Entertainment was censoring the anime with one hand, they were shamelessly milking it with the other. In Pokémon’s heyday (roughly 1998-2001), 4Kids produced an assortment of less-than-official media tie-ins exclusively for the American market. These range from the cheesily excellent album “2.B.A. Master,” many reps of which powered me through this mammoth post, to a camp-tastic “Pokémon Live” musical stage show which was nearly lost to time…thank God for the internet. –Pokémon is such a behemoth, I could talk about it for a few thousand words more. I mean, I haven’t even mentioned the movies. But luckily, I don’t have to…because our own Andrew Kim has created a comprehensive retrospective of all 15 to date. -By the way, this is one of only two anime you’ll see on this list. But the other is still a long way off.